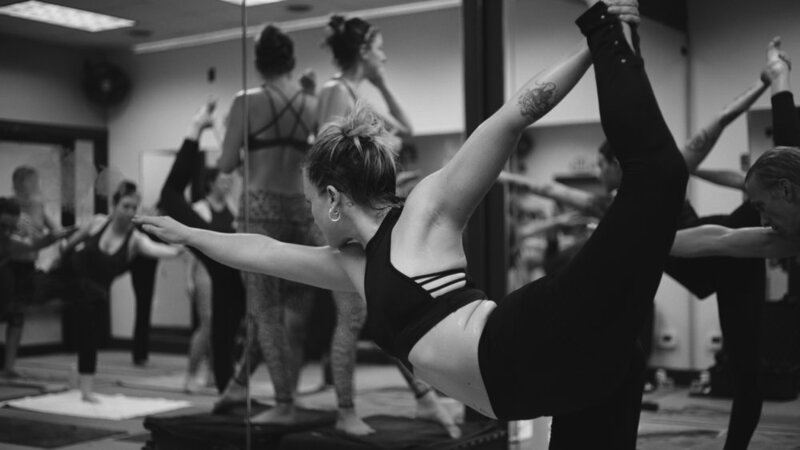 Our class schedule is growing, and therefore sometimes subject to change, but we do our best to keep you updated on any cancellations and pop-up classes! Scroll down for our rates and class descriptions; and if this is your first time make sure to look over the frequently asked questions and find out what to expect. Class reservations are NOT required—you can just show up. If it is your first time to the studio, please arrive at least 15 minutes before class starts to fill out paperwork and get oriented. This class is the true, authentic Bikram series–26 postures and 2 breathing exercises designed to work the entire body—every bone, muscle, joint, tendon, ligament, gland, organ, and blood vessel. The room is heated to approximately 105° Fahrenheit, with roughly 40% humidity. Also known as the Bikram Beginner Series, the same postures are done in the same order every class; so once you have taken one class, you will know what to expect every time after that. This class is 90 minutes long. This class uses the same postures and sequence as the regular Bikram hot class, but it is done quicker, with more flow and less rest time. The Express class is 60 minutes, rather than 90. The Silent class (whether regular or Express) is also the Bikram series–the exact same sequence as the regular Bikram or Express class–but instead of leading you verbally through the postures, the instructor practices with you–leading by example. This class requires a working familiarity with the Bikram yoga series, and thus is NOT appropriate for first-timers. (However, if the Silent Classes are the only ones you can come to, please contact us and we will work with you!) The silent class is an opportunity for experienced Bikram hot yoga practitioners to practice with an instructor. This is a fun and challenging sequence that includes Bikram beginner postures, deep hip openers, backbends and inversions. The class is 2 hours, and is comprised of 84 postures and 3 breathing exercises. Like the Bikram and Bikram Express, it is practiced at 105° to help your muscles stretch and detoxify the body. This is the original sequence Bikram practiced with his guru Bishnu Ghosh before creating his Beginner class. Students who are new to yoga should start their practice with the regular Bikram class before trying the Advanced class. If you have questions about whether this class is for you, please speak to us at the studio. Warm Gentle is a beginner-friendly, gentle practice to bring ease and opening to joints and muscles. It is ideal for those who feel inflexible, who want stress relief and who want to ease particular body issues. Athletes and people recovering from shoulder and back injuries use this class to add stretching to their routines; it is also a perfect class for those who may not be quite ready for a hot class! The Warm Gentle/Deep Stretch class begins as a slow full body warm-up through most joints and muscle groups. It progresses to more traditional yoga postures that emphasize balance, strength and stretch. The end of the class will focus more on deep stretch of large muscle groups and relaxation. Often a theme for the day will unfold as we work the poses. Temperature is approximately 80°. This is a hot version of our Gentle class! Part Vinyasa, part Gentle, this class stretches the entire body. The temperature is set at 101°, for a deeper stretch and a bit more of a workout. Hot Power 50 is a 75-minute class practiced at 105°. The series is based on, and very similar to the Bikram series, involving 50 postures instead of 26. It is a detoxing, full-body workout. The prenatal class is a warm class designed to stretch, strengthen, and prepare body and mind for pregnancy, labor, and delivery. It is the pregnacy modifications for the Bikram series, and thus is a fairly “rigorous” prenatal yoga class, to really help you get/stay in shape and prepare for the rigors of labor. Please bring a pillow, cushion, and/or a folded blanket for the final relaxation. The Prenatal class runs only on a contingent basis, when there are enough students. If the class is not on our class calendar, it is not currently running. HOWEVER—if you are interested in Prenatal Yoga, please contact us! Once there are enough interested students, the class will run.